"In these times of wonderful revolution, and incalculable & sudden changes in the fate of empires and the fortunes of individuals, the only good things of which we can feel absolutely secure are the possession of our minds, & of the esteem & affection of our friends." -Maria Edgeworth to Etienne Dumont, 12 August 1815. In June 2009 I flew to Albuquerque for Jerry Weinberg and Esther Derby’s class in experiential session design. I landed a couple of days early, partly because I’d flown from England and needed to deal with jet lag, and partly to spend a little pre-arranged time with Jerry. On the morning of June 20th we had planned to drive to Tent Rocks, a national monument with bizarre and wonderful rock formations. But it was raining, and threatening more rain. Jerry said the canyons could be dangerous and he wanted to see if it cleared before we went. 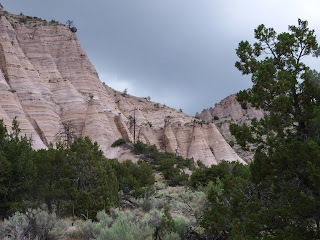 The sun shone bright after lunch, so we drove to Tent Rocks and set out on a loop hike into the canyon. A light rain started again almost immediately. We walked for a while, but there were some very narrow passages with high sides—okay to walk through usually, but they’d be traps in a flash flood. And there were several tiny canyons running down the mountains, and feeding into our canyon on either side. We met a lot of people coming in the opposite direction and one of them said there was a storm coming over the ridge. Jerry said the biggest danger is rain above you, which can suddenly turn to flash floods several feet deep rushing down the canyons, and it wouldn't do for us to be in a place where we couldn't climb to higher ground quickly. He couldn’t do anything like that quickly, so we stopped and went back. Of course the rain stopped too, once we were almost back at the start. Feeling a little cheated and still in the mood for an excursion, we didn’t want to drive back tamely the way we’d come. The good gravel road we’d entered the park on continued past the hiking trails, so Jerry thought we could drive on through and come home that way. We met a ranger who said he thought the road would be ok. He told me the Navajo name for the place and got me to say it a couple of times. 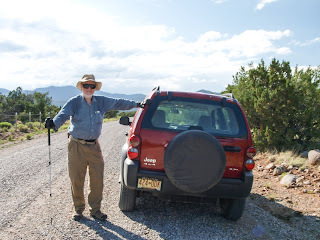 At first the road was indeed excellent gravel, but it soon turned to rocks and dirt and Jerry put the Jeep into 4-wheel drive. It became an adventure drive like a couple we’d done together before: happily jolting along on a "primitive" road without a map. Jerry adored difficult drives and the scenery was glorious. There were good bits of road, and then bad. Some of it was extremely challenging, with deep cracks and potholes and large rocks. A fallen tree partly blocked the way at one point. For a while, we drove alongside a sharp drop off a steep cliff. After some time, the road became less definite. It was harder and harder to tell if the faint track we were following was road at all, or if we'd missed the way when it branched. We knew that homeward bound had to be downhill out of the mountains, but we kept climbing steadily. As Jerry drove carefully on through the forest of thinly spaced trees, I watched out the windows for any tracks that looked as if they might possibly be roads. Eventually we had to acknowledge that we’d reached a point where there really was no road in any direction. We hadn't met a soul or seen a car since talking to the ranger, and apart from very occasional horse poo and a single soft drink can, there’d been no signs of civilization whatever. With only two or three hours to sunset, we were getting a bit concerned. We stopped to consider our state and our options. We were out of cell phone range. We didn’t have a compass. We weren’t in any present danger, but driving a rough track near cliffs after dark would be risky and foolish. Whatever we did, we might not make it out of the woods before dark. We devised a contingency plan. There was plenty of bottled water in the back of the Jeep and a somewhat grubby cotton quilt. We had a few hard candies. If we were forced to sleep in the vehicle, we could keep warm and hydrated. In that eventuality, Jerry would try before dark to place the bright red Jeep somewhere where it could be seen from below if anyone came looking for us. Obviously, spending the night in the wilderness had nothing to recommend it but possible necessity. Jerry was most anxious that Dani wouldn’t know where we were. An incorrigible urbanite, I was anxious at being lost in the woods and I was also worried about Jerry, aware that he was in pain and not feeling his best. We needed to make a decision and get moving. Jerry never liked backtracking. On any of our road trips I could never convince him we should go back to the diner or motel we’d just passed. However hungry we were, however late in the day, he always wanted to press on in the certain (though rarely realized) hope that we’d happen on another, better one just down the road. This time going back seemed the only prudent thing to do. So we agreed to turn around—not easy in that space—and try to retrace our tracks. Jerry had to drive. He was tired and unwell but he was an experienced, skilled off-road driver. I’d driven the Jeep on challenging mountain roads, but I’d never driven off road nor in 4-wheel drive—and I had the better eyesight. At first we stopped frequently for me to squat down and scan the dry ground closely for something resembling our tire tracks. I continued peering intently out the open window as they became clearer. It was a considerable relief when we finally knew we were on the right track back to the park. Once, we came to a road going in the other direction that Jerry said his instincts told him would take us down the mountain and out. We did discuss taking it, but agreed it was better to go for a sure thing at that point. Arriving at the park gates just before dusk, we saw 5 mule deer silhouetted against the sky and several jackrabbits on the hill. On the road, the sunset and the light on the mountains were gorgeous and when we were back in town and looking for a restaurant I spotted a coyote. Dinner was BBQ, of course. Back in my B&B that evening, I reflected gratefully that despite all that mutual anxiety we hadn’t wasted energy on tetchiness, but had unhesitatingly moved into total problem-solving mode, discussing our options calmly and making decisions together with humour and mutual respect and trust. I wasn’t about to recommend getting lost in the wilds of New Mexico to anyone, but I couldn't think of many people I'd have trusted or felt as safe with in similar circumstances. Jerry called that afternoon “our experiential problem-solving exercise”—a prelude to the week’s class in experiential session design. The day had ended well, but I decided that I wouldn’t go off-road again with Jerry unless I could confidently take over and drive us away if he became ill. So I demanded that he teach me. Jerry harrumphed and said “perhaps”, but on our next road trip he directed me into a relatively easy off-road stretch and talked me through the rudiments. 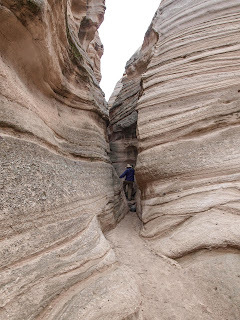 Later, we took a rough back way into Chaco Canyon and I got more practice. I completely got the allure. In 4-wheel drive on tough terrain, the Jeep felt like nothing I’d ever driven and I loved it. After Jerry’s death, I read a blog post suggesting that he had somehow lacked the capacity for friendship. Gobsmacked, I thought, “Well, that was your experience. It was certainly not mine, and I’m sure it wasn’t the experience of many others.” Au contraire, Jerry had an extraordinary capacity for friendship. I know of many people who loved him and rightly called him friend, and there are many more I don't know. That love wasn't one-sided. He had an unusually large number of real friends: deep friendships of the heart and mind. Many of us began with Jerry’s books, workshops or mentorship. Each unique friendship grew in its own way and through its own interactions.